Grevillea Moonlight is grows rapidly in full sun or strong indirect light. Grevillea Moonlight, with its creamy white flowers stands out in the landscape as a great specimen plant. Grevillea Moonlight can grow to 10-12 feet but accepts pruning well, even hard pruning. Planting Grevillea Moonlight next to a busy pathway will lead to a lot of work, best to keep Grevillea Moonlight back a bit where it can fill a space nicely without the need for regular or radical pruning. Grevillea Moonlight is a prime plant for bees and attracting hummingbirds. Several hummingbirds are always competing for the nectar throughout the long blooming season. 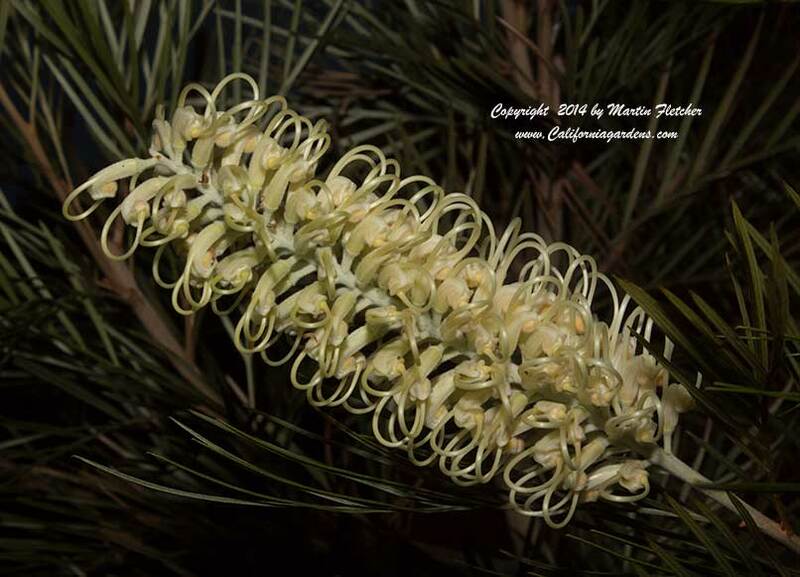 Grevillea Moonlight is sensitive to frost and not very forgiving. Grevillea Moonlight is damaged by temperatures that dip into the high 20's and die dead in the mid 20's even during short duration frosts. Flowers and foliage of Grevillea Moonlight. High resolution photos are part of our garden image collection.